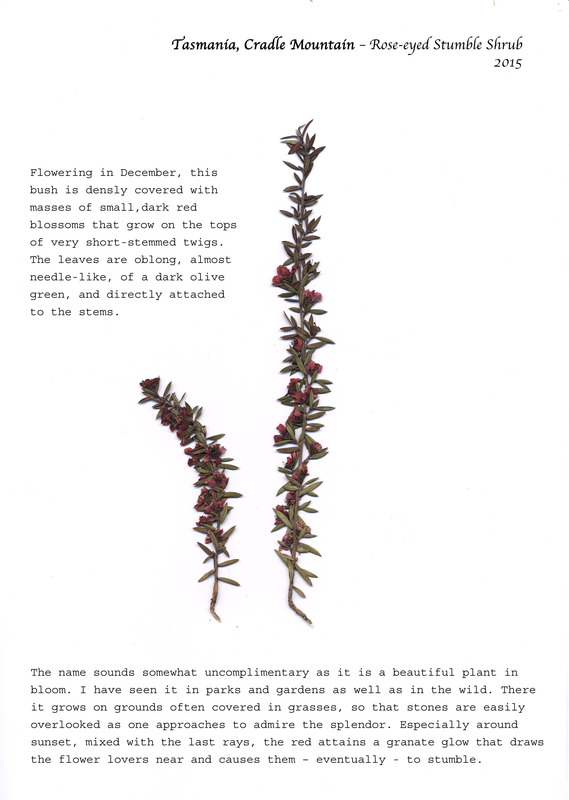 Australian Beauties reconnects to the work of German botanists travelling Australia since the 50s of the 19th century. Namely the work of Ferninand von Müller was vital for the botanic culture of Australia: Not only did he discover a great number of plants and became the renowned director of the Melbourne Botanic Gardens in 1857. 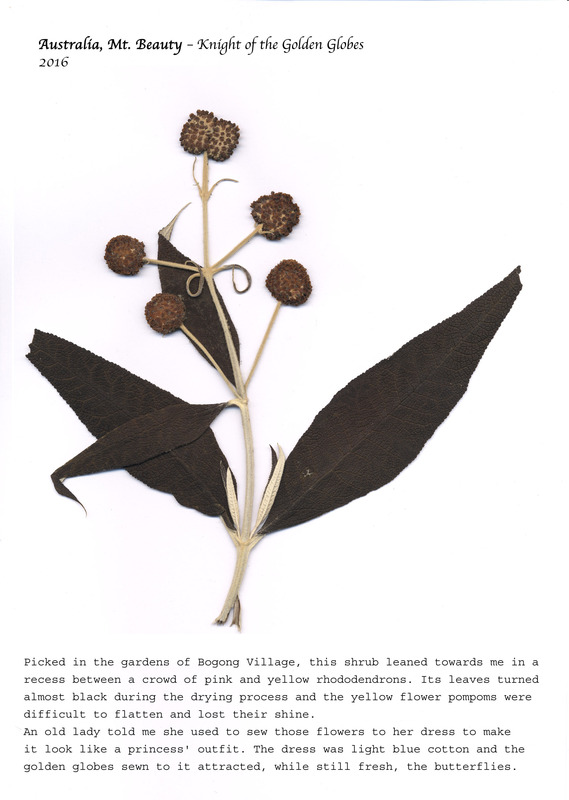 Even before that he started on the most extensive collection of pressed plants in Australia for a herbarium that still forms the core of the present “plant library” of the Botanic Gardens. 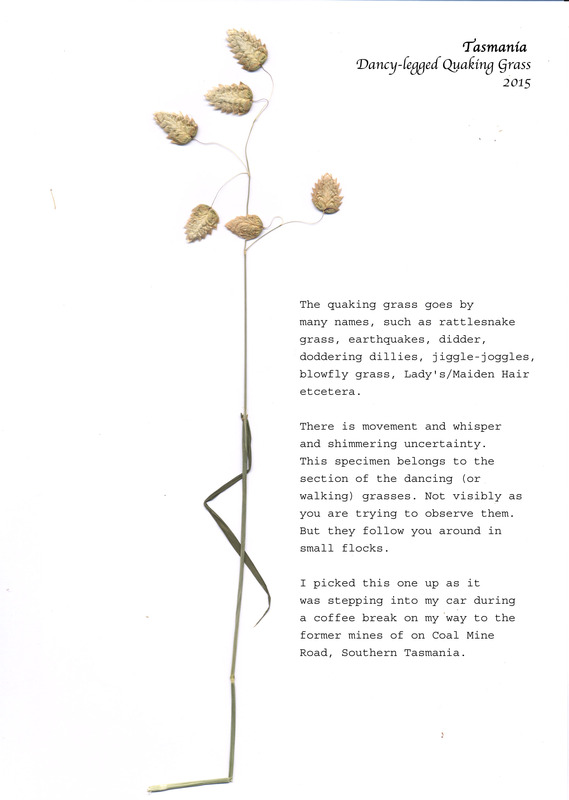 Australian Beauties is a “roadside herbarium” currently featuring 23 pressed plants from Australia, provided with reinvented names, but real situational descriptions and observations on the nature of the specific plant. The work draws on the spirit of discovery which forms such a great part of Western culture – and defies it at the same time in counteracting the “laws” of taxonomy, scientific soberness and order. The grit of the road still sticks to the pressed specimens. Some look ravished, some are just blossoms without stems or leaves, others have faded, unrecognizable colours… with the discoverer occasionally failing to remember the exact location (a gravelled parking lot on the A3, Tasmania). Australian Beauties hovers on the brink between the factual and the imaginary and between irony and wonder. The images are commented in English and German and will form a printed publication presented probably in 2017.